My husband always says; that I am very lucky to spend time with our son, Charles all the time. Yes its very true. Being a stay-at-home mom 24/7 with Charles is very challenging though he always puts a good laugh on me. Just the other day, I was very serious when I told Charles to picked up his toys and he said; I am going to call 911, and put you on a yard sale tomorrow. OMG! I was laughing out loud. Then he said; he is going to sell his jeep wrangler for $1 and made a sign that it has 100 horsepower. What if my husband Doug, and I gets older Charles is going to put us on Craigslist up for sale? Just kidding! Charles is a very loving kid. 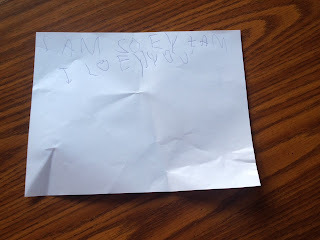 In fact, he gave me a note saying he’s sorry and I love you. 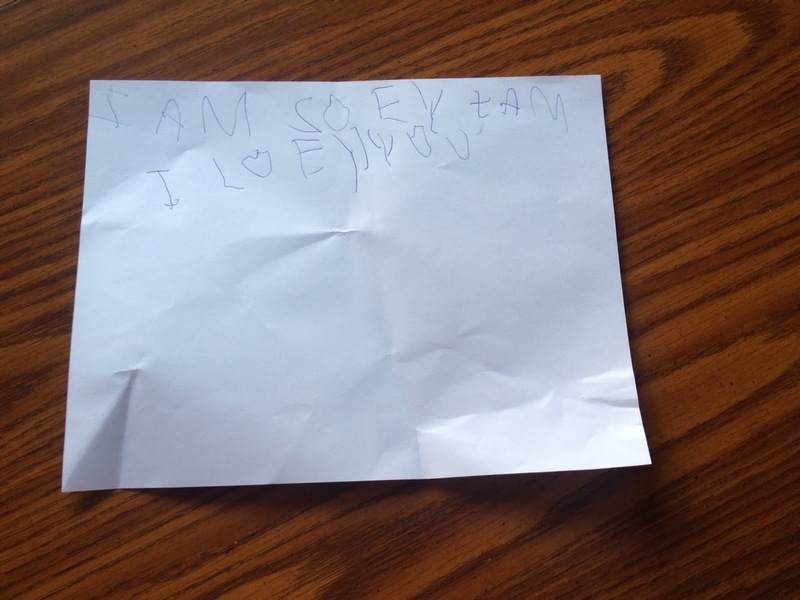 It was very thoughtful of him knowing he wrote it by himself without asking what the letters are. Writing is still his problem but I am not making it such a big deal. When the time is right, I’m sure Charles would be more willing in writing rather than saying it to him now that he needs to learn how to write letters and numbers. When it comes to reading he is very good at it and I am very proud of him. Sometimes I wonder are these kids now really so advanced when it comes to technology? And when it comes to adult conversation Charles always has something to say and he won’t stop talking for hours which is very funny to us. Anyway, are you done with your Christmas shopping? Not for me as we are going to shop tomorrow for Charles’ Christmas presents. I really don’t know what to buy Charles as his presents though last night he whispered to his dad that he wants a scooter. The problem with a scooter is Charles does not know how to even ride his bicycle without training wheels. How much more harder is a scooter? Well, how’s the weather like in your area? Here in Northwest Arkansas, the weather over the last few days has been great after the winter storm we had. As much as I like having a white Christmas I’d rather not have snow. My husband was already out of school for one week due to the winter storm. If there’s another winter storm coming the school will take longer than normal as they are going to make up school for snow days. It has been six years now that I am living here in the United States of America. When it comes to the weather I don’t mind it now. Though I have not experience an ice storm and tomorrow’s weather is making me a little bit nervous especially when we could lose our electricity. Growing up in the Philippines, I am used to not having electricity so I am kind of used to it but not with my boys. Anyway, we bought more foods tonight but not frozen ones just in case we don’t have electricity. I also baked a Classic Yellow Cake tonight and Charles is looking forward to tasting it. Hopefully, this winter storm is not going to last longer or else we can not watch the football game on Saturday. My hubby’s favorite football team, Missouri Tigers, is playing for the SEC Championship game and we want to watch the game. If we don’t have electricity and the weather is really bad we don’t have a satellite signal as well. Going to Seoul Market, in Springfield, Missouri, is one of my favorite places to shop. 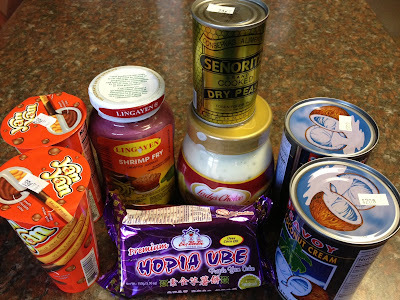 As the store has tons of products from the Philippines, and I always look forward to getting bean bread that I really love to eat. The last time we went to Seoul Market, the store was out of bean bread and I was very disappointed. The person I asked said; the products will arrive every Wednesday in boxes and it is always sold out the next day from their store. So I thought I can make my own besides, it cost quite a bit every time I will buy bean bread. Making homemade bean bread was very easy. I boiled a small packaged of red beans for about one hour or until the beans are done. Mashed with a spoon or you can put the beans in a food processor to create bean paste. Seasoned with sugar according to your taste of sweetness. 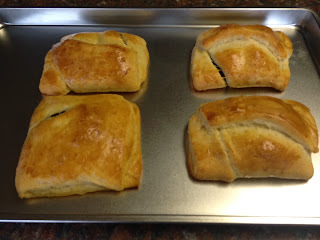 Since I could not find puff pastry at Walmart, I used Pillsbury crescent rolls. Put the bean paste in the middle, brushed with egg wash then fold the sides into the middle. 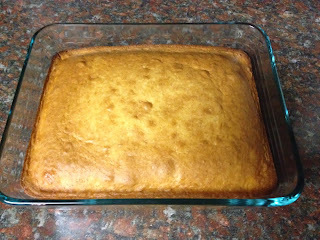 Brushed with egg wash on the top then put in the oven for about 12 minutes or until the bean bread is golden brown. My homemade bean bread tasted really good and I am going to make some more once I‘m out of my bread. Could you believe Thanksgiving is almost here? Yep! And my boy is very excited as he saw turkey on television and said; mommy its Thanksgiving. Every Thanksgiving we always visit with my husband’s sister who lives in Kansas City, Missouri, and his other sisters come down to Kansas City as well for Thanksgiving. Usually I pack our clothes ahead of time but at the moment I have not packed anything. Maybe later tonight or tomorrow I am going to start packing some belongings and my hubby can pack his own clothes. So, what are you most excited about for Thanksgiving? For me, is the food, seeing family members, watching Macy’s Thanksgiving Day Parade, and of course shopping. We always shop the day after Thanksgiving and that’s the fun part finding deals at the store. There are some shoppers who already started camping at some stores here in Rogers. They want to get the best deals the store has to offer on Black Friday. This Thanksgiving and many years to come I have had so many reasons to be thankful. My family back home in the Philippines are all safe after typhoon Haiyan, destroyed every thing we had and lost so many lives. On Wednesday, it is my 6 years anniversary since I came here to the United States of America. 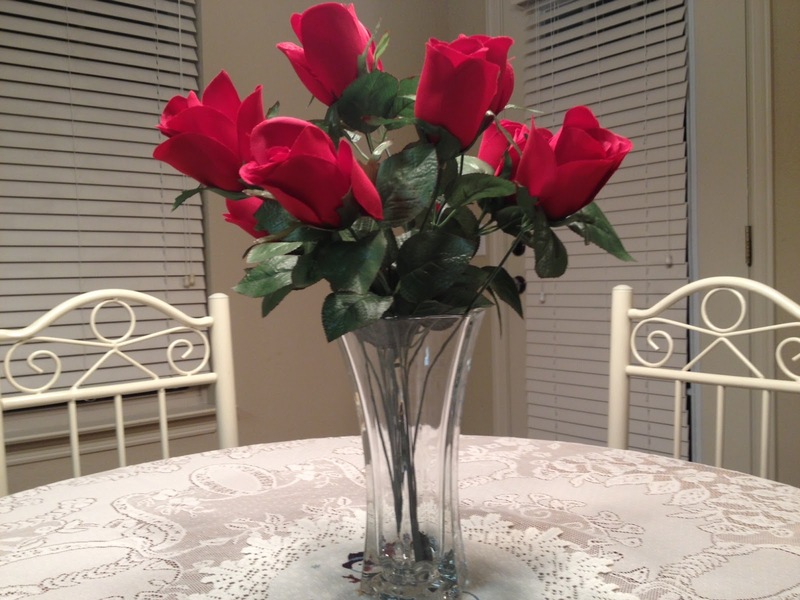 Thanks to my wonderful husband and his family members for being so supportive with us. If you have someone that you are buying presents for that loves country or simply décor, then why not make their present packaging something they will love. A well made burlap gift bag, can be the perfect finish for a gift to that person. Well made, well priced and looking great a burlap gift bag is just what you need for that special person's gift. A few days ago, we went to Walmart and the parking lot was very crowded. I said to my hubby there must be something going on inside. So when we were inside we saw people in lines all the way to back so I said I don’t want to fall in line when it is for grocery checkout. That’s ridiculous! Then my husband asked an associate what’s the long line was all about and he said; The Pioneer Woman. I know The Pioneer Woman, Ree Drummond, as I watch her show on Food Network. 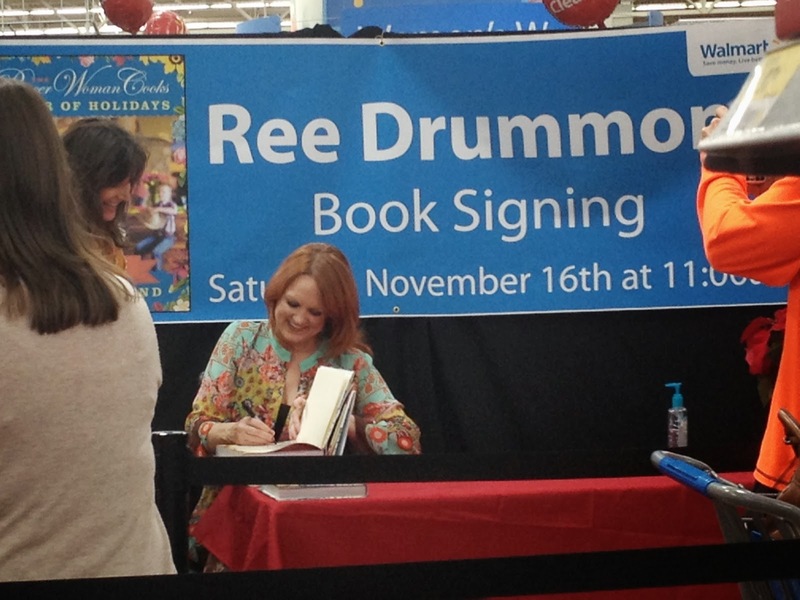 Though I never bought any of her cookbooks, I took a picture of her book signing autographs. As a viewer, I was very curious to see how she looked like in person but she looked the same on television. The Food Network Channel, have always been my past-time when I have nothing to watch on Bravo. Maybe when it was Giada De Laurentiis, Sandra Lee, Ina Garten, or Bobby Flay, I will buy their books and have it signed. 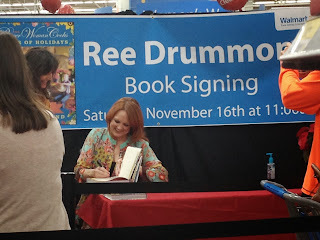 So on our way back home, Doug, asked me if I was happy when I saw Ree Drummond, and I said hmmm I don’t know I was just curious how she looked like. Then what if you see Chris Hemsworth, and Liam Hemsworth, in person Doug, asked? I said; Oh my god! I’ll be screaming. To me the Hemsworth brothers are very handsome. How about Nene? Hmmm not really. She’s the one from The Real Housewives of Atlanta. How about Beyonce? I said; I’ll be screaming and jumping for joy when I see her in person. Beyonce is a very nice person. I got to know more about her when I watched her documentary, Life Is But a Dream, on HBO. 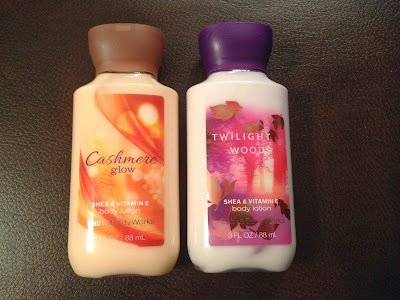 I do really like my free Cashmere Glow, and Twilight Woods body lotion from Bath & Body Works. The smell of Cashmere Glow is very relaxing when I tried the lotion today and definitely this lotion is going to be on my favorite lists of lotions from Bath & Body Works. All the products of Bath & Body Works are all great and well-worth your money. This time of the year is my hubby’s favorite time of the year. It’s Football season and the weather is perfect to watch any game during the day or night. Since my hubby is a huge Football fan we are going to watch Missouri Tigers and Florida Gators at the stadium this weekend. Though the Missouri Tigers Quarterback, James Franklin, was injured the last game while playing against Georgia and he’s done for the season. Charles not a big fan of Mizzou so he likes Florida Gators to win and he said he is going to make a sign that says; GO FLORIDA. Charles only likes Florida because it is blue and one of his favorite colors. The three of us are looking forward to watch the game but not the long driving going down to Columbia, Missouri. Definitely Charles is going to say his back is hurting so he can get out from the car. Every time I will say we are going to visit your aunts on Thanksgiving, and Christmas Charles always say; it’s a long drive. Anyway, every thing is packed for this trip and hopefully we can have a nice trip down to Columbia. If you are looking for a new home, apartment or even a business space join the 21st century and use your smart phone or tablet to help you find the perfect spot. There is a great tool in the, goconnect real estate checklist app. Having the ability to check whenever and where ever you want for your perfect space will help you snap up that dream place you are looking for. A few days ago, we celebrated my son’s 5th birthday and we all had a great time. The theme of his birthday party was Mickey Mouse and he also had a Mickey Mouse Clubhouse cake. The cake was decorated beautifully though it did not taste as good as what we were hoping for. Charles got lots of presents that he really wanted for his birthday especially the ones that he’s been wanting to have for a long time. 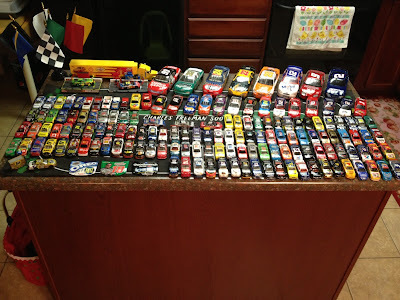 Like, the number 27 Paul Menards NASCAR Car, Disney Pixar’s Rip Clutchgoneski, Silly Slippeez, Doodle Dome, a Red Wagon, Marbles, Croquet Set, and Tomica Gas Station to name a few. Thanks to all of his aunts and uncles who always spoil their only nephew. The night before Charles’ birthday we went to Chuck E. Cheese’s. For Charles’ birthday, we played Bowling at Fast Lane, and Mini Golf, at Golf Mountain, here in town. We all had a great time including all of my sister’s-in-laws. And before they left back home, we ate at Copeland’s of New Orleans for Sunday brunch. Copeland’s has the best Sunday brunch in town in case you are looking for a place to eat every Sunday with your family and friends. Whether its College Football or NFL our weekends are glued to watching football games. Aside from Football games, NASCAR Sprint Cup and NASCAR Nationwide Series are also a big part of our weekend television watching as well. It was very disappointing that two of my favorite drivers Brad Keselowski, and Jeff Gordon didn’t make it to the chase for the Sprint Cup this year. Both of these drivers have not won any NASCAR Sprint Cup races this year. So a win to either of my drivers would have been a great one and put them into the Chase for the Cup. Doug though was happy as his favorite driver, Carl Edwards won again. Doug was also happy that Mizzou won Saturday though they did not play great. Even though Doug’s Raiders lost he was happy with how well they played vs Indy. I though was not happy with my favorite player, Eli Manning as he threw three interceptions in the Giants loss to Dallas. If you are a proprietor of a hotel and would like to find a great way to order Hotel Supply Online then you need to look at the PeachSuite Hotel Supply and Atlanta Hotel Supply for all your needs. Whether you are looking for Hotel Bar Supplies like stools and glass ware or simply comfortable and great looking furniture for your business the PeachSuite and Atlanta Hotel are what you are looking for. Great products at great prices is what every one that owns a business is always searching for and with this great company you have found it here. Make your hotel a true destination that travelers will return to again and again over the years. If you make your hotel someplace to remember then your customers will come back again and again. As well your customers will write good reviews of your hotel and give you goes word of mouth. If you are a shade tree mechanic like my husband, Doug or a professional mechanic you need to always use the finest products for your repair jobs. If you are looking for the best in CV Joint Repair then you need to look no farther then C.V. Specialists. The Cv Specs for CV Joint Repair products from C.V. Specialist are truly industry leading. CV Joints for those of you uniformed are part of the suspension system of a vehicle. Your car or trucks ride and handling relies on these parts to be in top working order and well maintained. Something as simple as a torn CV Boot if left unattended can lead to expensive repairs. C.V. Specialist are though not just expert in their CV Products but offer a wide array of automotive repair products as well as specialized Metal Fabrication. Make sure you always put the best on your automobiles, in the long run it is better and cheaper. My hubby is a huge gamer. Right now he’s into NCAA Football games with his favorite team the Missouri Tigers on his Xbox. But sometimes it irritates the hell out of me. I hate when he keeps on complaining when he is playing the game. Get real Missouri Tigers against Alabama Crimson Tides on the SEC Championship Game who’s the better football team? Of course it’s Alabama. Doug really likes the Missouri Tigers and so do I. Doug and I have been to a couple of football games last year and we would love to watch it again this year. But when you are playing on your Xbox of your favorite team you want to win every game you play and sometimes the result is different than what you expected. I know he gets frustrated sometimes when he is playing the game and I feel really bad. I’m also afraid he might have a heart attack especially with his health issues God forbid. Just like Charles, before he gets mad every time he loses a game when we play our games on game nights. Now, he knows how to be a good sport when other people win the game which is a good thing specially when he goes to school. Charles my four year old son soon to be five year old son has had a starter drum set for two years now. Charles loves to play his drums and my husband and I are planning on buying him a new ludwig accent cs combo exclusive 5-piece shell pack at wwbw. We love the styling and functionality of this set as well as the Ludwig brand, a true leader in drumming. Does Anyone Notice The Cooler Temperature At Night? Does anyone notice the cooler temperature at night? Well, this is the kind of weather that my hubby likes the most, cold weather. Perfect time to roll down the window of the car though I know my hubby is kind of hesitant now rolling his window down. The last time he rolled the window down it was broken so he had to take the car to the repair shop. When we are thinking we can save money then there goes the problem right away and we had to spend money which we don‘t have laying around. Why it always has to be that way? Anyway, could you believe this month is almost over? Back to school and for moms out there you probably are missing your kids going back to school. My son, Charles doesn’t go to school yet. I am sure we are going to miss each other a lot when he starts next year. I always told him that I am going to miss him when goes to school. And Charles always says; why can’t you be a teacher? Which is funny to me. Well, my hubby is back to work since last week though regular classes starts today. Surely, it is going to be a busy year for him especially during the Wrestling season. With the weather getting cooler during the day you are probably spending more time outside working on little things around the house to make it look beautiful. By adding some touches of your own personal style you can make your home not just appear better but make you happier with its look. Whenever you are looking for address plaques or address house signs, Mailbox And Beyond has the widest selection of great quality products at a great price. Customize your home and garden décor just in time for Football season, Halloween, Thanksgiving, and even Christmas. Yes you read it right. Mailbox and Beyond offers Whitehall Products to suit all your needs without breaking your budget. The more you add your own personal flare the more you will love your own home. You can also really showcase your style not just to yourself but all of your neighbors or even those just passing by. I had quite a busy weekend. Two of my sister’s-in-law, Cheryl, and Connie, visited us for the summer and we really had a great time. We went to the Flea Markets but the third store that we’ve been to smelled really bad so I took Charles with me and just waited inside the car. We also played 18 holes of Mini Golf at Golf Mountain here in town. My sister-in-law Connie, and Charles, scored a whole in one and I scored two back-to-back whole in ones as well. Though at the end of the game Doug and I tied so we had a tie-breaker and Doug ended up winning. I also drove the car wherein my sister’s-in-law rode with us. They said; I did a great job, though inside of me my heart was pounding because I was a bit nervous. Well, to end up their visit we ate at Copeland’s of New Orleans for Sunday brunch. 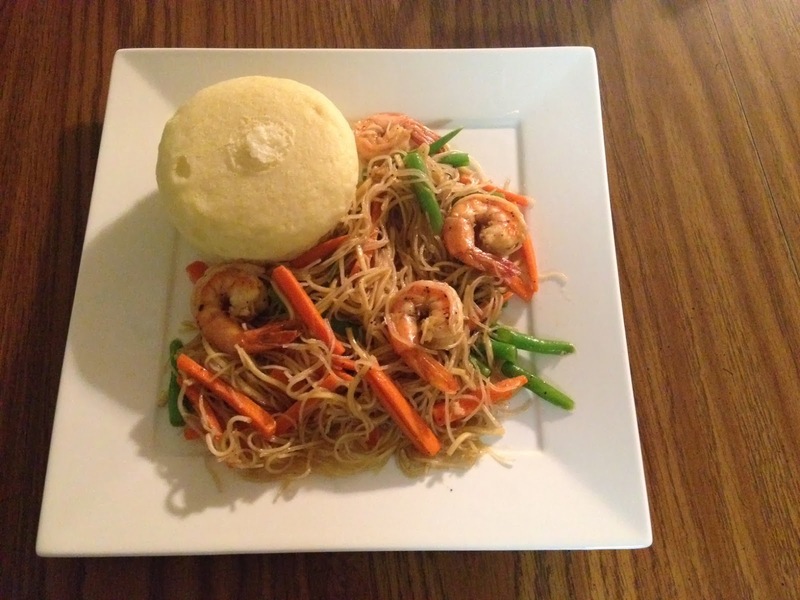 As always the food tasted really good and the service was excellent. My weekend would have been perfect except when our car broke its right side window at the back. Hopefully, it can be fix today when the service center isn’t so busy so we do have to worry in the next few days when it is raining outside. It’s been raining almost every day so it is not a good day to be outside or have a broken window. Having no money and getting swallowed by debt every paycheck can totally ruin your life. New laws passed in the late 2000’s make bankruptcy harder then ever. If you have questions about bankruptcy a free bankruptcy consultation is just the thing for you. You may qualify for the preferred Chapter 7 or the more complex Chapter 11, but the key is finding out what is right and legal for you. What a beautiful day today. Not too hot, perfect to do some things outside the house like doing sand colored artwork with my son, Charles. Our sand artwork looked pretty good and Charles and his dad played Frisbee afterwards. Well, I have not done so many things lately over the weekend aside from passing my vision and written test to get my permit to drive. I’m still very nervous driving the highway and I know I need to be confident being on the road to avoid accidents. Doug always says; I need to be watchful on the cars around me and pay attention on the road. Anyway, how are you doing with your summer break so far? For us, we are all enjoying my husband’s summer break especially Charles though he has wrestling practice 3 days a week now. Charles doesn’t like waking up in the morning when his father is not around, how much more when he’s back to work in August? Aside from spending more time with the family, this Friday we are going to watch a movie, Turbo. This is the third time that Charles is going to watch a movie at the theater. Hopefully he will like it as he loves watching NASCAR and Indy Car races on television and doing his own races as well. Every weekend we are all hooked up on watching Sprint Cup Series and Nationwide Series. If you are ever in the need of industrial supplies for your home or business you need look no further then Reid Supply. Reid Supply hand wheels and levers are some of the best available and are available at a great price. Having a reputable and stable supplier whose product is great is necessary for any business owner or home owner. 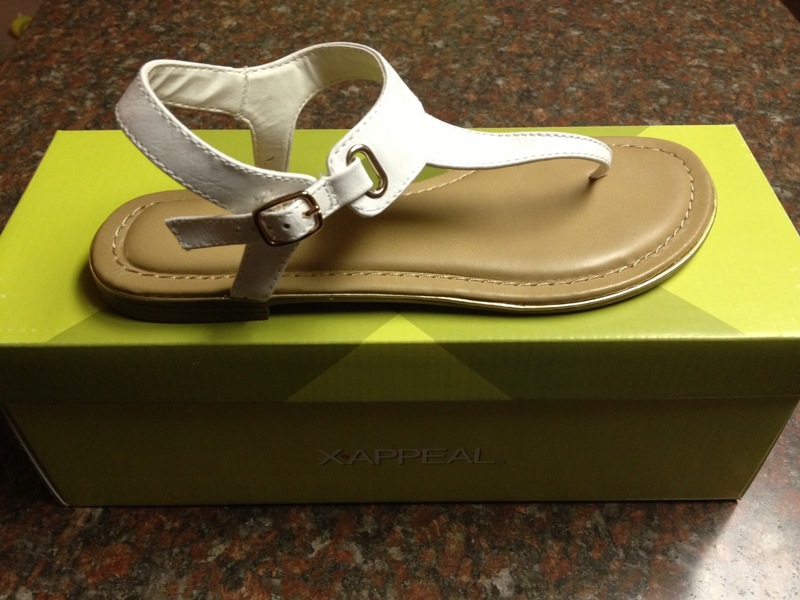 Growing up I never really had the luxury of buying things that I really like. Whenever we wanted something like toys and new clothes we had to work for them by doing things like doing household chores around the house. Then when we could afford something we can have it. Over the years, I have been very infatuated with having a Swatch watch on my arm. I think Swatch watches are very flashy and cool to look at and it will look great on me. While browsing on the web I really liked the Swatch, FLEUR’S D’ETE. I love the color though it is a bit over-sized in terms of dimension which I like as well. I definitely want to have this watch for Christmas and a sewing machine as well. Yeah I want a sewing machine as a Christmas present this year would be a great gift for me. As I looked at our bedroom curtains I thought I can make curtains instead of buying them at the store. One panel can be pricey depending on the type of fabric you are looking for and we used 4 panels for our bedroom window. It looks like it is very easy to make and sew when I have my sewing machine. Sounds crazy but I keep on thinking about it of making curtains and other DIY things for the house. Today is the first day of the month. As you noticed I have not really updated all of my 3 blogs. Not getting any tasks to work with is very disappointing so I had decided not to post anymore. Though posting on a regular basis could improve my page rank but its alright. Anyway, how’s the weather like in your area? Here in Northwest Arkansas, the weather has not been very hot unlike the other parts of the country wherein the temperature reached up to 130 degrees. Way too hot, that could even cook cookies outside. With the temperature here in Northwest Arkansas, around 80’s we are all enjoying this kind of weather. Just yesterday, we went to Golf Mountain and played mini golf instead of going to the park. We all liked it especially Charles. In fact when I asked Charles last night whether we will go to Chuck E. Cheese’s or Golf Mountain on his birthday and he answered, both. I guess we will go to both on these places as his father already told him as well and Charles was very excited. Seems like yesterday, I can’t believed my son, Charles will be turning 5 in September and he is looking forward to his birthday. 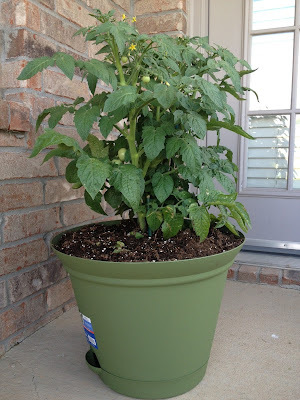 Well, I haven’t done many things lately and I am getting obsessed with my plants outside, tomato, bell peppers and lemon grass. Watching my plants makes me excited knowing I can reap some tomatoes and bell peppers in the next few weeks. How about you? What have you planted in your garden? 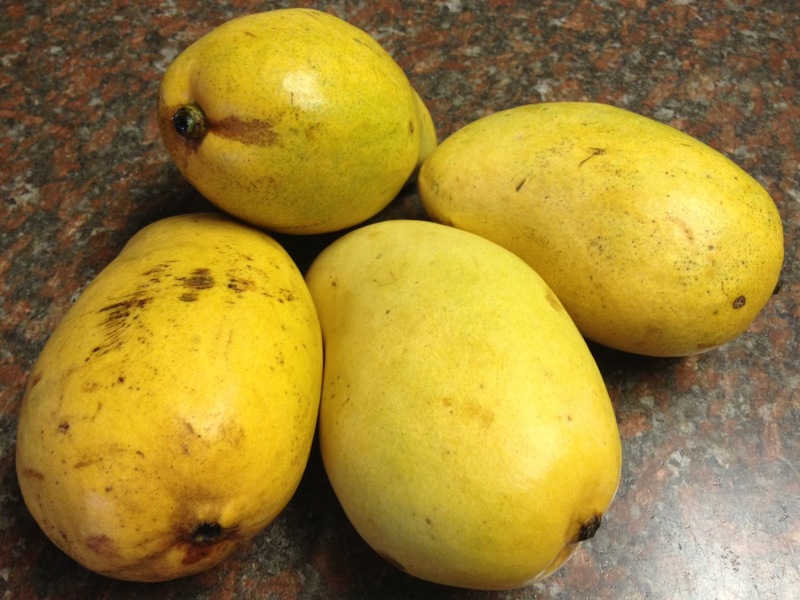 Its better to grow your own produce instead of buying it from the store even though they are very inexpensive. 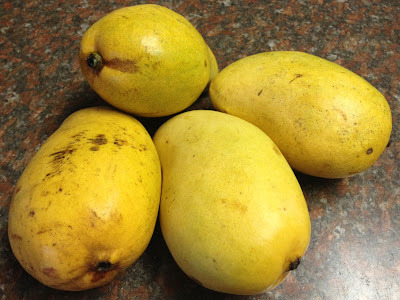 Knowing my produce, where they are coming from gives me a peace of mind that these plants are not loaded with pesticides. I have never heard about Tree Hut Hand & Foot Care products in the past until I found out the great benefits they can perform for your skin. Over the past couple of months now I have had dry skin and I don’t feel like using lotion. To me, lotion is greasy and it makes me feel uncomfortable especially in the summer. I have been trying products over the counter but I haven’t found the right products that will work for my skin. 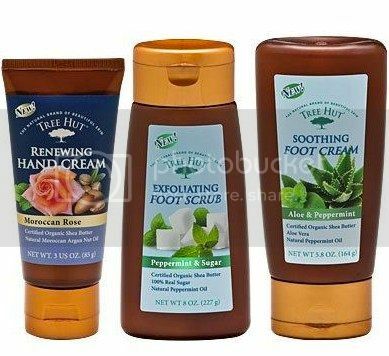 I would love to try Tree Hut foot cream, Tree Hut hand cream, Tree Hut foot scrub for myself and see how it works on me. And what makes Tree Hut products different from other products available on the market? Well, Tree Hut Hand & Foot Care products are developed to keep hands and feet feeling smooth and healthy. Certified Organic Shea Butter and Natural oils and extracts make your skin smooth and soft. Organic Shea Butter keep your skin repairing and moisturizing with every use. Anti-aging, which promotes elasticity and peppermint oil for a soothing effect. Natural sugar exfoliates your skin to keep your skin smooth and most of all non-greasy formula which I was looking for. I just created my summer Natural Beauty Style and I would love to share it with you. To hear more exciting news about these products be sure to like Tree Hut on Facebook, and follow Tree Hut on Twitter and encourage your friends to do the same. Tree Hut products are available at Walmart stores nationwide. Today is my husband Doug’s last day at school. Thank God, the school year is over. He can spend more time with us and play with Charles most of the time. This summer Doug and some of his wrestlers are going to World’ of Fun in Kansas City. Charles and I are not going because some of the kids are going to ride in our car. Of course, Charles was disappointed when I told him that we can’t go to Kansas City. He asked me; “Why the kids can’t ride in their own car? Why can’t they ride the school bus?” I really don’t mind not going to World’s of Fun, as we are going to visit his sisters in June. Visiting my sisters-in-law is quite a trip and Charles doesn’t like taking long trips at all. Well, only 3 days left and this month is almost over. What have you been doing so far before the summer comes? As for me, I’m planning to practice driving our car so I can have my driver’s license. To be honest I am really nervous thinking about myself driving the car on the road. I know its good for me to be able to drive on my own so I can go anywhere I want but sometimes it just freaks me out. Sometimes when we are on the busy highway like the Interstate, I always tell Doug I can’t live here in the U.S. by myself. It’s very nerve racking. Anyway, only a few days left before the season premiere of The Real Housewives of New Jersey, and Keeping Up With The Kardashians. What can I say, I am a Bravoholic fan. Aside from watching reality shows on television I have been watching the NBA Conference Finals. I pull for the Miami Heat and Charles likes the Miami Heat as well. We’ve been living here in Arkansas for a couple of years now we have been exploring the area. I do really like living here in Northwest Arkansas. It’s very scenic specially going down to Eureka Springs. Yesterday, while exploring some Flea Markets and Antique Stores Doug had decided to go to Siloam Springs and eat at the Cherokee Casino. Driving down to Siloam Springs felt like we’re going to nowhere. No signs on the road and noticed few drivers in front of us are driving under the speed limit which was kind of annoying. So we found Cherokee Casino across the border of Arkansas and Oklahoma. As soon as we got inside the door slot machines are busy and the restaurant that we’re looking was just beside the corner. I was really impressed by River Cane. The restaurant looked very pricey but I was amazed how affordable it was to eat at River Cane Buffet. They had nice selections of menus from different cultures which was a good thing. As usual Charles liked the noodles and he ate quite a few. On our way back home Charles kept on asking; are we there yet? Thank God it didn’t took us so long driving back home. We also had Charles haircut and I was very impressed how brave he was when trimmers were used for the first time on his hair. My four year old son, Charles is very competitive in every game we have. It makes him very happy every time he wins the games. He always gets mad when he losses a game. Aside from playing games Charles also gets upset when his favorite NASCAR driver, Brad Keselowski does not win the race and his race car color is not blue. Doug and I always tell Charles that he cannot win all the time. We also tell him Brad Keselowski’s race car changes its paint scheme for sponsors and he is the same driver even if not in his blue Miller Lite car. It is not good for him when he plays with the other kids especially when he goes to school next year. Those are the only things that Charles is not good at, losing games and Brad Keselowski not winning races or having a different paint scheme for his race car. As the summer begins it is once again time to work on improving our home and yard. With my husband, Doug being a teacher the summer is our preferred time for home improvement. One of the easiest and yet most exciting things for this summer is putting up new mounting brackets for our big screen HDTV. Elevating your TV makes for a more enjoyable watching experience. It is also much safer if you have young children around. Whoa! First day of the month and I am looking forward for this month to be over right away. Just kidding! But anyway, only 4 weeks left and the school year will be over. My hubby is very tired especially at the end of the school year so he is looking forward for this month to be over as well. For next month, my husband’s cousin, Marla is getting married and we are invited for the wedding. Just in time for the summer as we are going to visit his sisters before they visit us in July. Aside from visiting my husbands sisters Doug is planning to go to World’s of Fun in Kansas City. I have not been to World’s of Fun as it doesn’t excites me thinking about the roller coasters and other rides. Not being a scary cat, I just don’t want to ride the roller coasters. My son, Charles and I both love coffee. There is no better way to start my day then a nice warm cup. I have found my favorite brand and it is Folger’s. If you want the same great taste and a whole sale price on folgers coffee click here. The best at a great price is always something that I am looking for. Well, only 3 days left before the end of April and I know we are all looking forward for the summer to come. The weather has been weird lately and the other day we had severe storms. Finally today, I saw the sun shinning through our window and I want to get out from the house and do something fun. Speaking of fun, just last week we watched the NASCAR Sprint Cup STP 400 at the Kansas Speedway and we all loved it. All the race car drivers drove the cars very fast and I am amazed every time the car passed where we sat at. Very loud even though we are all wearing earplugs. My son, Charles was very excited when he saw the number 2 race car of his favorite driver, Brad Keselowski. Of course we saw all the drivers before the race began when they were on their way to their respective race cars. Though the one that hit the jackpot was Charles. My husband, Doug bought a couple of NASCAR cars and other collectibles for Charles especially from his favorite driver Brad Keselowski. Watching NASCAR Sprint Cup race last week makes us wants to watch another race in October though it would be great if we can get more free tickets. I like the atmosphere at the racetrack and the people seems very nice even though we are pulling for different drivers. Charles did a great job during our first NASCAR Sprint Cup race even though he fell asleep for about 40 minutes during the race. Well, we got up too early then. We really had a great time and Charles got to play with his aunt Connie and they had so much fun playing. Anyway, today I am planning to use my Dillard’s gift card and Victoria’s Secret rewards cards. I have 2 Victoria’s Secret rewards cards and if I don’t use them they will go to waste. Today, is Hero Appreciation Day offered by Krispy Kreme and I have my coupon to buy any dozen, and get a second dozen original glazed doughnuts for free. Surely, today is going to be a great day for us. Whenever you are looking for address plaques, address signs, or house address plaques, whitehall products has a great selection just for you. As well as a huge selection of almost any type of outdoor decorations for your homes, Whitehall products has just the designs that you are looking for. Aside from address plaques, and mailboxes the store also offer customized home and garden decor like crocks, lanterns, birdfeeders and sundials. All these fully customizable products are the perfect way to keep your house and yard more beautiful and interesting. What a great way to make your home, yard or garden yours then to have it decorated with your own personal items. Personalized doormats are also available to suit your needs, what better way to invite in your guests then to have them greeted at your doorstep. Take advantage of the free shipping on your online order. The Whitehall products website is easy to use and the whole shopping experience is very rewarding. Do you have a Parking Spot near your airport and town? If so, which airport? I have never heard about Parking Spot until I came across it on this website, theparkingspot.com. The Parking Spot is more than just a space to park your car. They focus on hospitality, making it easy, comfortable and affordable to get a superior airport parking experience. Founded in 1998, the Parking Spot is the leading near-airport parking company in the United States with 34 locations at 22 airports. It has great amenities that make near-airport parking more enjoyable. With fast and easy check-in and check-out. Friendly shuttles every 5-7 minutes and airport parking reservations are available for your convenience. At Parking Spot, guests ride to and from the airport in the company's distinctive yellow and black spotted shuttles, which pick up guests at their vehicles or valet lobbies and run continuously to the airport. Shuttle drivers offer complimentary luggage assitance upon departure and return. Additionally, guests are provided with a complimentary newspaper upon arrival and chilled bottled water at exit. You may also join the Spot Club, the industry's most flexible airport parking rewards program that offers free parking with as few as seven paid days. Be sure to checkout the Parking Spot locations near you and consider using them on your next trip or vacation. Parking Spot is a national chain with 34 facilitlies at over 22 airports. On our next trip we will definitely use Parking Spot when we travel to Chicago to renew my Passport. Be sure to follow @TheParkingSpot on Twitter, and like the Parking Spot on Facebook. With so many shows to watch on television I can’t get enough of Bravo’s, Married to Medicine. Two housewives are Medical Doctor and other housewives are married to an MD as well. One of the housewives, Quad Webb-Lunceford, has a very strong personality though she is quite funny to watch. Last night, Quad was guest of Watch What Happens: Live on Bravo and she was hilarious. Aside from Married to Medicine, I am also looking forward for the season premiere of The Real Housewives of Orange County tonight and Don’t Be Tardy, airing this April 16 on Bravo. Anyway, three of my magazine subscriptions are going to expire this June and I am not planning to renew 2 of them even though I still have rewards points to use with my Coke Rewards. I am not really impressed with either Bon Appetit and Cooking Delight Magazines as it doesn‘t show a lot of pictures of the food recipes in the magazine. Well, it has been a long time since I have received any tasks from one of my favorite publishing sites. Its kind of disappointing knowing I still have $37 due to me and I need to wait until I reach $50 before they can send out my payments. As a blogger have you ever wondered where your audience and traffic sources are coming from? When I checked my stats today I noticed I had 3,716 page views last month from China, not including other page views from other countries. This makes me a little bit worried as I don’t know any bloggers from China and I have never visited any blogs from China. Well, as you can see on my blogs I only have a few posts that are posted. Not getting tasks from blog advertising sites makes me feel lazy and not want to update my blogs as much. Anyway, how’s your weather like in your area? Here in Northwest Arkansas we’ve been pretty lucky enough when it comes to weather. Just a couple of days ago we had severe storms and I was very thankful it wasn’t bad as expected by weather forecasters. Those days we had storms my husband, Doug was gone to the State Wrestling Tournament in Little Rock, Arkansas. And speaking of that wrestling tournament well, the kids got beat really bad and I knew how much Doug was really disappointed. I was disappointed as well when I found out about his wrestlers didn’t get as many medals as expected. How much more when my son, Charles would wrestle in the future? Surely his first loss would be heartbreaking for me. My husband’s wrestlers are not his kids but I could feel the disappointment every time someone wrestled and lost each match. Its just hard to see when someone looses knowing how hard they practiced for the last year. We all had quite a busy day yesterday. Charles got his haircut at Sports Clips and he did a great job when the lady cut his hair. 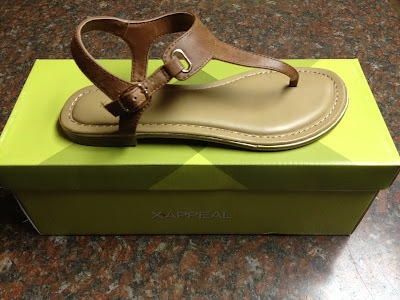 Doug used his Dillard’s gift card that he got from Christmas last year. I didn’t buy anything when we went shopping though I was looking forward to looking for sandals in my size which is 5. Then we went to the Asian Store in Springdale, Manna Oriental. I got excited when I saw dried fish inside the refrigerator so I bought 6 packs of them and other Pinoy products. 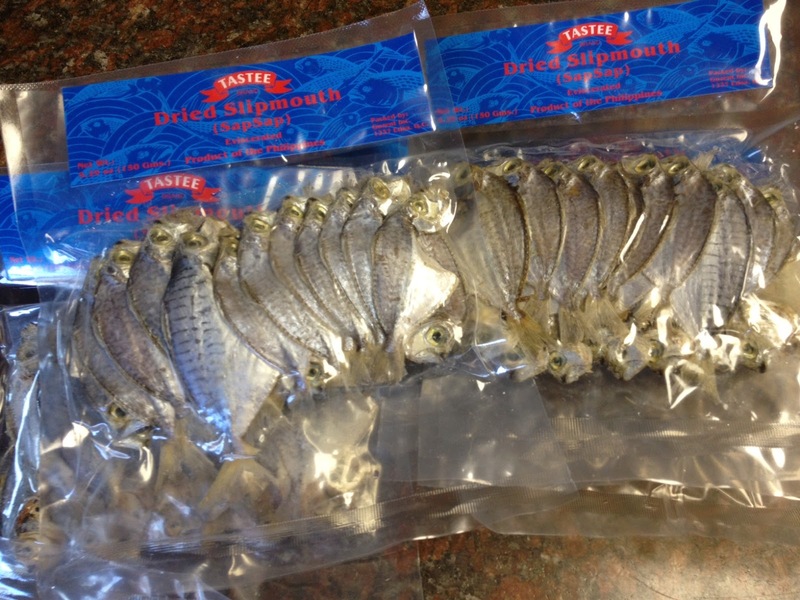 That’s the dried fish that I really like the best so I thought I better stack up on them. 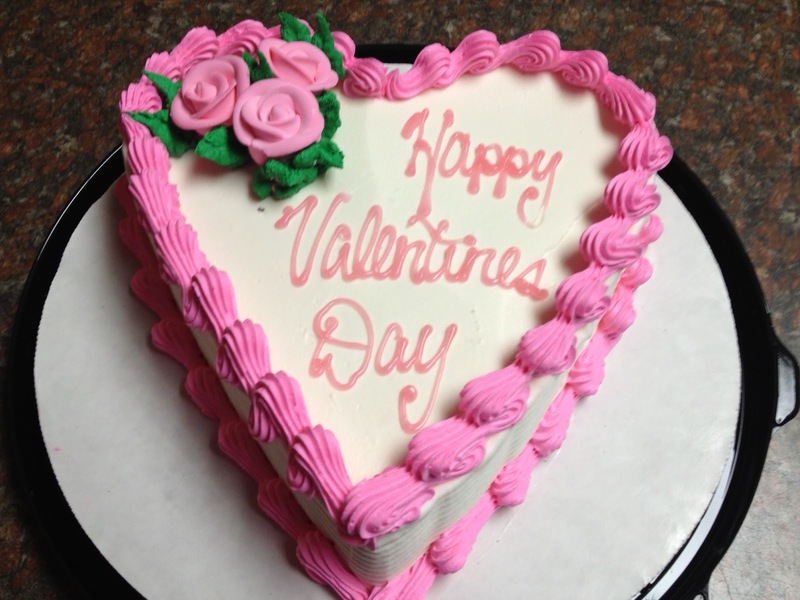 I loved our Ice Cream Cake from Dairy Queen. It looked pretty and it tasted really good. Charles picked it himself and I think he did a great job. He knew mommy's favorite color is pink. Though Charles didn't give me a Valentine's balloon as my husband said, no more good balloons were left at Walmart. My husband gave me a Victoria's Secret Gift Card, and a Rice Cooker & Food Steamer. The gifts were just perfect because the Secret Rewards Card from Victoria's Secret is back on February 28. For our dinner I made Lasagna and it tasted really good together with garlic bread. Recently I was reading Bloomberg Businessweek and came across an interesting article about marty hanaka. Mr. Hanaka is the Executive Vice President and Chief Executive Officer of a company I have blogged about many times, Guitar Center. I found it interesting that this man runs a company that is so successful and that I have used that company to order instruments for my son, Charles. My feet are still sore from walking yesterday. We went to two different Antique Stores and Charles got NASCAR Cars and 2 Drag Race Cars. I also shopped at Kohl’s while Doug and Charles were both sleeping in the car. 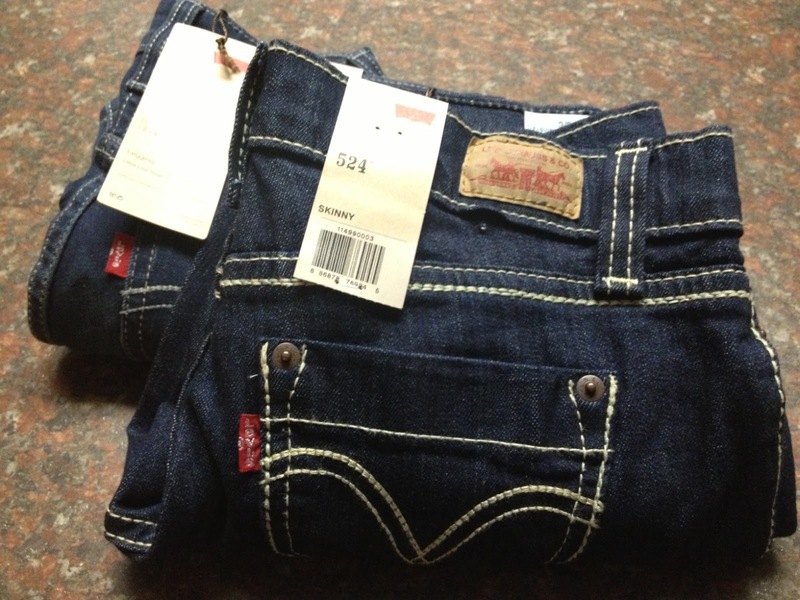 I bought 2 pairs of Levi’s Jeans, and shirt that was on clearance. I do really liked Skinny Levi's Jeans. It fits perfectly on me and most of all it was on clearance. Then we head down to Walmart for our grocery shopping. Since Valentine’s Day is Thursday I had decided not to eat out for dinner as we have been eating out most of the time. It usually takes 30-45 minutes to wait at the restaurant even though Doug will make a reservation for our dinner. Charles doesn’t like waiting and he always complains, this is taking so long. 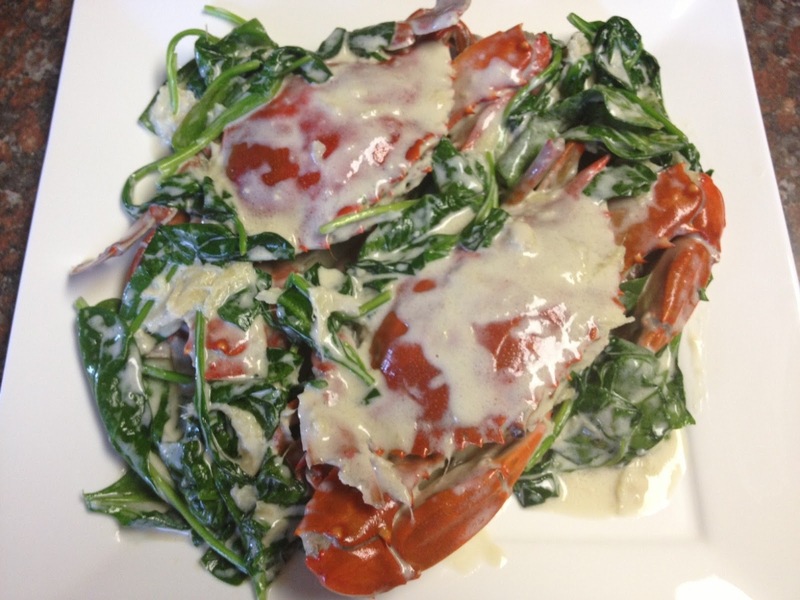 We all love lasagna and I think it will be a great meal for Valentine's Day. We were driving on our way down to Fayetteville when Charles, read the road sign, “Road Work Ahead”. Charles said; “Road Work Ahead but no people are working”. Charles is very opinionated he says what’s on his mind with a sense of humor. Just like when I told Charles, you were inside my tummy and Charles said, “Why did you eat me? I was laughing so hard when I heard it from him. Well, Valentine’s Day is just a few days away and Charles wants to buy Valentine’s balloon for me. He said it is his surprise for me and he kept on saying it over and over again. I asked him where are you going to get the money and he said in his piggy bank. He knows where his money is. Anyway, I had watched Super Bowl XLVII last night and I loved Alicia Keys, soulful rendition of Star Spangled Banner. I also loved the halftime show with Beyonce and former Destiny’s Child members Michelle Williams, and Kelly Rowland. And for Super Bowl commercials I like the M&M’s, Tide, Taco Bell, and Pistachios. The Super Bowl XLVII Champions goes to the Baltimore Ravens they beat the San Francisco 49ers 34-31. The 49ers were behind and made a comeback after the power outage around the 3rd quarter but the night was for Baltimore Ravens. Who would have thought the San Francisco 49ers, and Baltimore Ravens would play in Super Bowl XLVII? Neither did I as I was thinking one of these NFL teams would play on the Super Bowl, Green Bay Packers, New Orleans Saints, Denver Broncos, Atlanta Falcons, or New York Giants. Watching Super Bowl XLVII is quite interesting to watch both head coaches, Jim and John Harbaugh, are brothers. I have seen their parents interviewed by media outlets and the couple are very happy and proud for their son’s achievements. Surely the game is very emotional to watch especially at the very end of the game. Imagine these brothers are competing against each other to win the Super Bowl XLVII Championship?